The Virginia State Capitol Disaster of 1870. We're staying in Virginia for this post as well...and, by the way, this is another one that made me shake my head when I realized how few people knew about it. The worst loss of life disaster to ever befall any state capitol building in the nation, right here in The Old Dominion, and very few people have even heard of it. I'm talking very few people in Richmond have ever heard of it. ...Wait!?!?!? you say. Political Controversy involving local government...and a mayoral election at that...in The Old Dominion's capitol city???? How Can This Be?!?!? Hang tight, gang, you're about to go for a hay-ride. 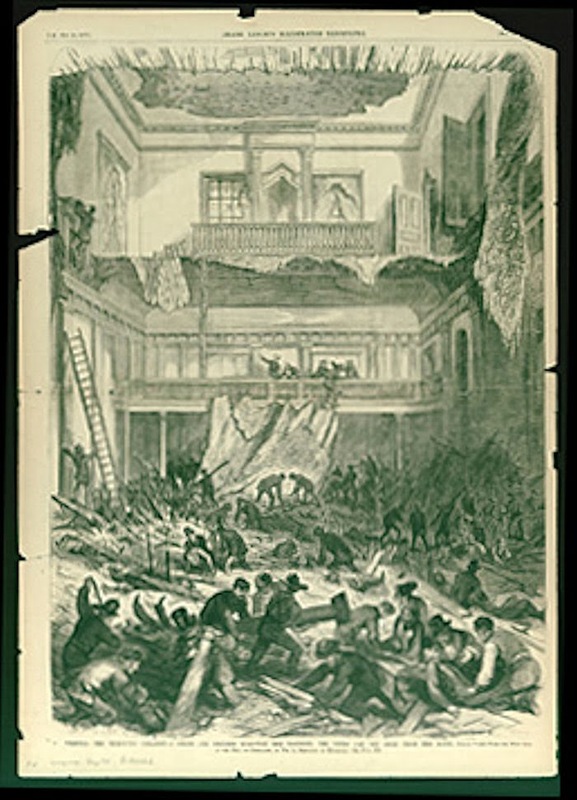 Not only was mayoral controversy alive and well in the 19th century, it did indeed indirectly lead to the worst disaster, loss of life-wise, ever to hit a state capitol building in the United States. And yep, another familiar phenomenon...cost cutting and politics in the State government...were pretty much the direct causes of the disaster. When the the state government of The Commonwealth of Virginia moved the State Capitol from Williamsburg to Richmond in 1780, they left a perfectly good capitol building behind and moved to a city that didn't have a capitol building there-in, meaning that for a good while the state government was housed in a now long long gone 'makeshift building' in Shockoe Bottom (My bet is that it was some kind of warehouse that was purchased and modified for the purpose.). As you can imagine, the State Legislature wanted out of that place and into an actual capitol building like, yesterday. Among Thomas Jefferson's many many talents, he was a first rate architect, and he was hired in that capacity to design a new state house, to be built on Shockoe Hill, overlooking the falls of The James River (Which it does to this day, though a couple of centuries of construction and expansion have placed buildings in between the capitol and the river, blocking the awesome view that what would soon be known as Capitol Square had of the Falls.). The Maizon Carree, the Roman temple that Thomas Jefferson based the Va State Capitol's design on. ...And right from the get-go that ancient conflict between architect and builder that's been fought countless times over uncountable centuries began. The builders won this one, in particular a Richmond builder named Samuel Dobie who, at the behest of the State Legislature and the Governor, made major changes in Jefferson's design, One of the biggest changes was losing the low podium type foundation that was in Jefferson's design and turning it into a full basement. Change numero dos was moving all of the offices that were to be on the Capitol's third floor to the aforementioned full basement, where they'd be both more practical and more spacious. The basement...and offices there-in...extended beneath the building's portico, which meant that, in this era long before electric lights, the offices in the very front of the basement would've been dark windowless caverns. So the steps...and front entrance...were also eliminated (A pair of grand side entrances were substituted) so these offices could be built with windows. Moving theses offices from the third floor to the basement also helped set up the disaster that'd occur eighty or so years later, by the way. This undated photo show's Va's capitol building pre-1904 renovations...and what it looked like from the front at the time of the collapse. Note the side entrance (There was one on each side of the building, and these were the main entrances until the 1904 renovation) and the basement windows at the front of the building. ...So that's exactly what they did, building a court room, conference room, and related office space above the House chamber. And, as has happened for centuries, they did it in the most...er, let's call it economically expedient...manner possible. Rather than embedding the ends of the floor beams in the walls of the building (Which would have required more intrusive and expensive construction techniques as well as more time) they used an already existing offset in the wall that created a four or so inch ledge. The ends of the floor beams were rested in small notches that were cut into the offset to accept the ends of the beams, and were held in place, apparently, only by gravity. Once the floor itself was completed the courtroom and assorted offices and rooms were built as needed. Originally, central support pillars were provided in the House chamber, midway along the length of each floor beam, to support the new floor. This lasted maybe ten years...if that long. A view of the capitol from the rear...north...elevation. This would be the northwest corner of the building The courtroom would have been behind the third floor windows on the rear wall. At some point the members of the House of Delegates complained about how unsightly the support pillars were. And people in the know advised them that without those pillars that the courtroom and the House Chamber would very likely become one with each other, spectacularly. The House members decreed that this was impossible because the floors was supported by the very walls of the building, and said that they wanted their chamber to look like the dignified seat of government that it was and not some industrial building with unsightly pillars running down the middle of it. So, the pillars were removed, with no additional reinforcement of any kind being added to replace it. The fact that the courtroom not only didn’t end up in the House chamber sometime within the first month after the pillars were removed, but remained in place for nearly fifty years actually says quite a bit about the workmanship and materials used in constructing the new courtroom. A balcony was also added to the rear of the courtroom, creating an additional floor, and even more unsupported weight. 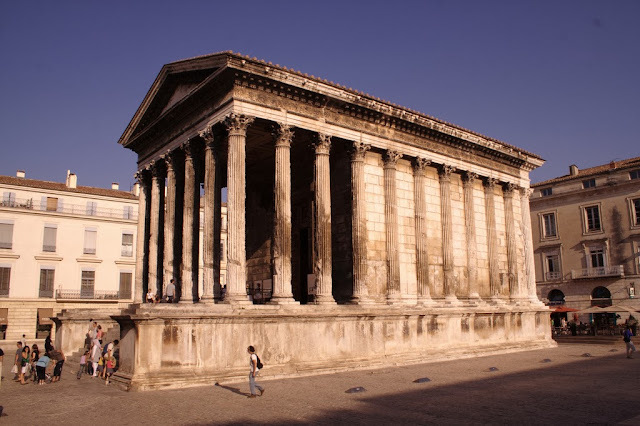 I haven't found any good description of how the balcony was supported, but I'm making the assumption that it was supported on heavy columns at the sides...where it attached to the walls...with central columns beneath the center, the central columns probably each mortised into a floor beam. This would have been great if the pillars supporting the floor beams had still been in place, but without them it just added that much more unsupported weight to the new third floor. The war ended in 1865, and Virginia entered a five year period of occupation and military government. This five year period...called 'Reconstruction'...came with an over-load of strife, corruption, and political shenanigans of it's own that are beyond the scope of this blog’s subject matter, but trust me when I say that 'Reconstruction' was a disaster of its own kind...and that it set one of the final pieces in the mechanism of The VA State Capitol disaster in place. ...But it wasn't. The guy who had been acting as Mayor under military rule...a northerner named George Chahoon...liked his job, had almost as much support as Ellyson, had control of and support from Richmond's police department, and considered Ellyson to be an illegitimate candidate for the office of Mayor. In short, he absolutely refused to leave office. The reason that Chahoon had the support of the Police Department was pretty much a no-brainer...he'd appointed the great majority of them after firing all of Richmond's white police officers and replacing them with black officers. During the two years that he was Richmond's mayor, he also purged the city government of anyone who had supported the Southern cause, which pretty much means that he got rid of the great majority of the city's department heads and office holders. Kind of makes me wonder just how he had any support from the citizens of Richmond considering that all of his decisions and action had been equally controversial. And he continued this legacy of controversy when he and his supporters made it more than clear that he wasn't planning on leaving office without a fight. And if it was a fight he wanted that's just what Ellyson's supporters decided to give him…literally…when they showed up armed to the teeth, layed siege to Richmond Police Headquarters and tried to force Chahoon out with...well, force. Oh...did I mention that Ellyson also appointed his own police force? The two sides fought, clashed, drew blood, arrested and tried each other and generally turned the appointment of a new mayor into a political cluster of major proportions. Finally (And before both opposing factions wiped each other out) cooler heads prevailed and they took the dispute to the courts. Then as now, the mayoral race was watched closely by the citizens of Richmond, even more so in 1870 given the fact that this was the first time that the city had been allowed to pick its own mayor since the end of the Civil War. The violent nature of earlier portions of the race just whetted the population’s appetite for more mayoral race drama. Ultimately the case made its way to Supreme Court of Appeals of the Commonwealth of Virginia. Now, some things just don't change much over the course of a century and a half or so, one of them being the media’s love of scandal and controversy in high political office. Therefore it’s no surprise at all that they were all over the mayoral race and its journey through the courts. Of course back then 'The Media' meant 'The Newspaper', which meant that every copy of each day’s edition of The Daily Times...the predecessor to The Richmond Times Dispatch...was snapped up as soon as it hit the newsstands. The hearing that would finally determine just who would be the new mayor of Richmond was scheduled for April 27th, 1870. Every household in Richmond probably had that date circled on their calendar. In 1870, major court cases were seen as a form of entertainment, and would draw huge crowds, and this one was as highly anticipated then as The Super Bowl or the release of the latest installment of The Hunger Games is today. Hundreds of people descended on Capitol Hill on that late April Wednesday, with those who got there early finding room inside. The public seating in the courtroom filled up within minutes, with the rest of the crowd climbing the narrow flight of steps paralleling the rear wall of the courtroom to the balcony. Back then that crowd inside the courtroom would have been comprised exclusively of the men folk of The City of Richmond, and they filled the balcony up just as quickly as they had the courtroom's main floor, managing to shoehorn somewhere between 350 and 400 people inside the Supreme Court of Appeals courtroom. And, as we await the beginning of the hearing...remember those ginormously long floor beams? The ones that had been supporting both the courtroom floor and the balcony with no central support and had been sagging for about fifty years or so? They weren't long for the world. The clock ticked closer to 11AM as the rumble of conversation filled the courtroom. The citizens who'd decided to attend the trial speculated on the outcome, debated the best choice for mayor, and discussed city and state politics in general. The minute hand on a clock set on the wall of the room eased towards 12 as the hour hand all but covered '11'. One of the judges and the Clerk of the Court walked in, talking about the case. The clerk made his way to his table and set his papers and books down as the judge mounted the bench. Another of the court's judges was still in the conference room. The Lawyers tumbled and slid backwards into the first row of spectators who grabbed and flailed and tumbled as the floor kicked downward from beneath them. Before the thought ‘What the hell??? ?’ could even begin to form collectively in a couple of hundred minds they heard another loud, staccato series of cracks from above them. When the main floor beam had snapped in half causing the center of the floor to bow downward it also pulled the columns supporting the balcony out from under it, yanking the center of the balcony itself downward and snapping the beams securing it to the wall like toothpicks. With all of its support structure gone the overloaded balcony slammed down hard onto the courtroom floor with a splintering crash, trapping the spectators below it between the two structures and not even slacking up as it carried the main floor of the courtroom down into the thankfully unoccupied House chamber below. When all of this happened Fredericksburg's Mayor Kelly, who had made the 60 or so mile trip from that city to attend the hearing, was talking to P.H. Aylett, one of Richmond's more prominent attorneys. Kelly ended up riding the courtroom floor down, but not before he watched Aylett take one to the head form one of the balcony's support beams. This same beam also killed well regarded reporter J.B Brock. Everyone's first thought was an explosion, and that the building was on fire. One group ran towards the building...women screaming their husbands' names...while someone else headed for the nearest alarm box. By then Richmond had both a salaried fire department and a telegraphic alarm system. RFD had five stations with five engines and two truck companies by then with the nearest companies being Engine 3 and Truck 1, on Broad Street on the present site of City Hall, and Engine 4 on S 4th Street, with Engine 3 probably being first due. The engines were actually designated as ‘Steamer’ companies back then, and were two piece companies comprising a steam powered pumper, and a hose wagon. Even before bells began banging out the box number at the stations, those outside the capitol made their way into the building, and fought their way through dust and wreckage into the house chamber. The House chamber windows were at least a full story off the ground and useless for access purposes, so the initial rescuers made their way in through the side entrances and through the building to the House chamber to find a broken mass of splintered floor joists and flooring, crazily jumbled furniture, and broken bodies…both living and dead. The cries and moans of the injured could be heard out on the grounds; inside they were gruesomely loud, with moans and cries of pain on all sides. Many of the injured were all but inextricably trapped...and remember this was 1870. 'Extrication equipment' consisted of the most basic hand tools and strong arms. Making the situation even worse was the thick, choking cloud of dust that actually suffocated some of the victims before they could be removed. The dust was so heavy that these initial rescuers could barely see or breathe, and a good bit of the initial rescue was carried out almost blind. They started lifting debris and wreckage off of the victims they could see, searching for those they couldn’t see and amazingly enough, they heard shouts from above them. One man…either a reporter or a lawyer…had made a desperate leap as the floor fell from beneath him and grabbed a mantelpiece along the north wall. Another half dozen or so had been near the big windows lining the capitol's north...rear...wall and had jumped, grabbed the window ledges, and were now hanging on for dear life, about 30 feet above the jumbled wreckage below. They’d have to wait for the fire department. The inside of the House Chamber immediately after the collapse...the area with the railing in the upper center is the judge's bench, which was just outside of the collapse area. The open doorways led to conference rooms. RFD is on scene at this point, and has begun rescue operations. From Harpers Weekly. Virginia's capitol building faces south...the rear of the building faces Grace Street, and a block away, Broad Street. The House Chamber ( And the Court room that was above it) was at the rear of the building. And, even though the house chamber was on the Capitol's first floor, it sat on top of that high full basement, situating it a full story or more off the ground, actually making it the second floor. I have a feeling both truck companies ended up on the scene, and both were stripped of ladders as the windows of the House Chamber were laddered. (And all were hand carried, hand raised. The turntable mounted aerial ladder wouldn't appear for about 16 or so years). Another view of the ongoing rescue operations...note the firefighters using the windows, which were along the building's rear wall, to remove the victims, and the mark left by the stairway to the fallen balcony in the upper left portion of the engraving. From Harper's Weekly. As the window and mantelpiece rescues were being carried out more firefighters made their way into the building and began lifting wreckage off of victims while civilians helped the ones who had relatively minor injuries out of the building. I have a feeling hand saws and axes were deployed in quantity. Among those assisting with the rescue operations was Mr D.B.White, a member of the State Legislature who had been in the balcony, and had ridden it down, escaping with barely a scratch. Rather than escaping the building, he made himself available to assist in any way needed. Outside view of the rescue operations. This was an engraving that used a photo of the capitol after the collapse as a reference. The photo of the collapse's aftermath that was used as a reference for the above engraving...note that the glass is out of all of the second floor windows along the north (Rear) wall of the building, and the debris that was ejected from the middle window. The injured and later dead were disentangled from the wreckage, carried to the windows, and then down ladders and laid out beneath the trees that not all that much earlier had shaded spectators who hadn't been able to get a seat inside, and spouses and other relatives of those who had. I couldn't find a time line on just how long the rescue and recovery operation lasted but I can bet 'Hours' would be a good guess. All of the bodies were caked with dust and many were disfigured, to the point in several cases their wives and other relatives couldn't identify them. The final count would be 62 dead and 200+ injured. 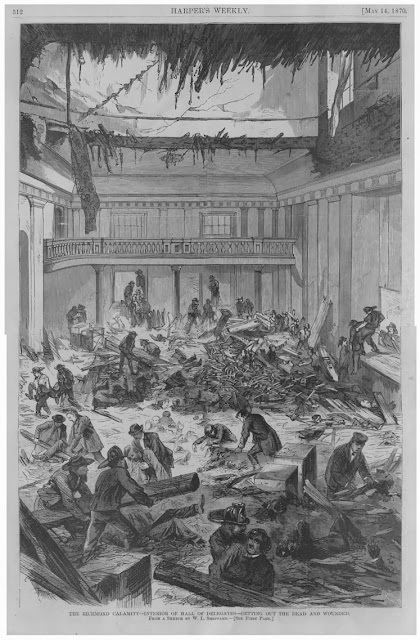 Thankfully the house chamber was empty when the courtroom and its balcony collapsed into it, but at least 350 men fell with the courtroom...the ones in the balcony almost 40 feet. The spectators who had been on the main floor were in the worst shape by far, as the balcony had fallen on to them before carrying the floor down, and I'd make a bet that that's where the great majority of the sixty-two fatalities came from. 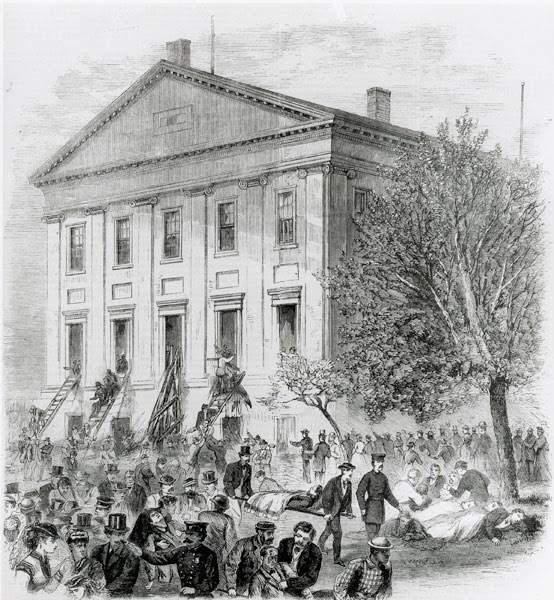 A slew of Richmond’s most prominent and influential citizens had decided to attend the trial, and a number of them were also among the dead and injured, among them Senator J.W. D. Bland, as well as several former Confederate Government officials and military officers. Former Governor Henry Wells was among the seriously injured. A number of the deceased victims were buried over the course of the following week, and the entire cite was in a state of mourning, as the State Legislature demanded an explanation of why the floor collapsed (And probably circled the wagons when they realized that their own predecessors' actions, from decades earlier, had contributed to the disaster in a huge way). As for the State Government...they were back to Square One, right where they were back in 1780 when the State Capitol was moved to Richmond. Temporary quarters were arranged and procured while the 'What Do We Do With The Broken Capitol Building' meetings were scheduled and held. Lots and lots of votes for 'Tear the thing down and start over' were voiced, and that was the overriding opinion for a while, but both fiscal and traditional factors played a part in the decision to repair the building. When the debris from the collapse was cleared it was realized (And probably suspected by many) that the only real structural damage was to the floor and balcony of the courtroom and ceiling of the House Chamber...The basic structure of the building was as sound as ever and it'd take far less time and money to repair the damage than it would to demolish the damaged building, then design and build a new one. This very relevant fact was pointed out to the rest of the State's suddenly homeless legislature by a gent by the name of Ballard T Edwards, a Free Black who was also a member of the House of Delegates, who argued the financial realities of repair versus replacement very effectively. While he was at it he also argued that the state had a duty to preserve their ties to one of their most beloved and and best known citizens. The building was repaired with little or no modification to it's layout...complete with the now properly constructed and supported third floor...and reoccupied. Maintenance on the building was still spotty, at best, for the next thirty years or so, and those of you who have seen Virginia's capitol building and studied it's history in any detail have, no doubt, noticed that it's present appearance is quite different from the Capitol as it was originally built. Around the turn of the Twentieth Century, State lawmakers decided, once again, that they needed more room, so again meetings were held and committees were formed and the rebuild vs remodel questions were once again asked...remodel won out in a big way, with the stipulation that Jefferson's original building not be changed in appearance any more than absolutely necessary. Design proposals were solicited, and any design that drastically altered Jefferson's original building were flatly rejected. The building that all this construction and inconvenience yielded was...Ok, I'm Virginia born and bred, so I may be a bit prejudiced here, but they ended up with masterpiece. The steps that had originally been part of Jefferson's design had been added and the interior completely remodeled (There was now an actual front entrance. The building had electricity by then, so those front basement offices now had light) and the house and senate had been moved to a pair of symmetrical wings that were near reproductions of the Capitols facade in smaller scale on either side of the building...the wings attached to the building with hyphens that connected to the main building where the twin side entrances had originally been. And The State Capitol Disaster? One of the things that amazes and puzzles me is the fact that most people in Virginia have absolutely no idea that it happened. A tablet and plaque were erected in The Old House Chamber in 1918 to memorialize the disaster and its sixty-two victims, but it's not a subject that's generally well known. Now, if that sagging third floor had finally given up the ghost at Oh-Dark-Hundred some morning with only the Capitol Police in the building, resulting in only property damage and lots of report writing, I could have understood it being one of the Commonwealth's historical footnotes, but this was a disaster that took sixty-two lives and injured a couple of hundred more...many of them prominent citizens. It boggles my mind a bit that it's not better known than it is. Among the 62 dead in the collapse were ten members of the Richmond Police Department, all of whom died in The Line Of Duty, as they were at the hearing to provide security....something that was not noted in any of the sources I used for this post. (And thanks to retired Richmond fire captain and good friend John Hinant for digging this up and alerting me about it). This would make their deaths the largest number of Line Of Duty Deaths in any single incident in R.P.D. History. It's bad enough that this fact isn't really mentioned in many accounts of the disaster, but even worse, what's very likely the most shameful aspect of this lack of recognition lies 90 miles north of Richmond. Somehow, the names of these ten officers were not included in the names sandblasted into the walls of the National Law Enforcement Officer's Memorial in Washington, DC. Efforts to have this huge and unforgivable oversight corrected are underway even as I'm typing this. The names are included in the Officer Down Memorial Page, and are listed below. Virginia's State Capitol is said to be haunted, by none other than the restless spirits of some f those who died in the disaster. And this doesn't come from anyone...this is straight form members of the Va State Capitol Police Department, among others whose job is the work in the building on The Night Shift. During the wee hours of the morning, howls and cries are said to come form the rooms beneath the old House chamber...and those screams are said to come from the spirits of men killed in the collapse who are still trying to find their way out of the wreckage. Now, the Capitol Police don't officially recognize ''Ghosts' as occupants of the building...but several of them, off the record, will tell you of strange and creepy things going bump in the night! One officer, on a routine sweep of the building, passed a man in the hall...the two exchanged 'How're ya doings', and the gentleman didn't seem nervous, but the officer realized that the guy didn't have an ID badge, so he called out to him. Now, no ID badge isn't necessarily an indication of anything out of place. They get left in desks...or cars...or at home..regularly. So the officer called out to him to ask him where his ID badge was, only to be ignored. The guy didn't run, or do anything shady...he just kept walking. SO the officer followed, the guy turned a corner, the officer followed, rounded the same corner...and the Mystery Man had disappeared. He called it in, other officers were dispatched, the building was locked down, and a thorough search was made of the building, but the guy had disappeared. As if in thin air. They finally decided that the guy had disappeared, and while discussing it the officer's eyes fell on the portrait of a long-dead citizen of Richmond who had been prominent in politics many decades earlier. And he realized that the guy in the portrait and the guy they had been searching for were one and the same. Speakin' of The Capitol Police...they are the oldest police force of any kind in the U.S. The Capitol PD originated in 1618...only ten years after the first colonists landed in what was to be Jamestown, while the Capitol was still in Jamestown, and moved right along with the Capitol through all of it's moves and trials. Members of The Capitol PD would have been the very first to respond to the collapse. The Va State Capitol Police still exist to this day, though the organizational name 'State Capitol Police' wasn't used until 1884, and are a very professional, top notch organization that represents The Commonwealth of Virginia to visitors from all over the world. 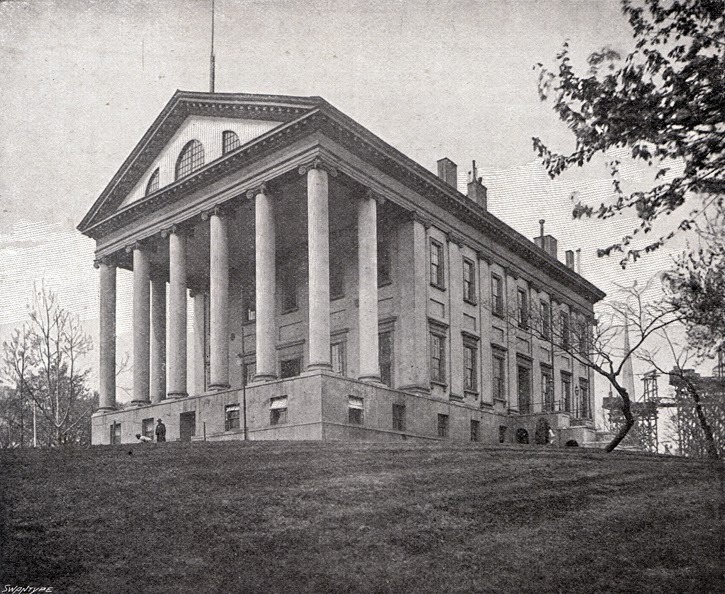 A project intended to enlarge the building was actually started in 1857, and reached the design and blueprint stage but was interrupted by The Civil War. Among the items on the punch list were completely remodeling the interior, removing the side entrances, and finally giving the building a true front entrance and front steps. All of this and more were done when the building was modernized in 1904. I have a feeling that if The Civil War hadn't put an end to the 1857 effort the sagging third floor would have also been properly reinforced, and the Capitol Disaster wouldn't have ever happened. While everyone today knows the Va State Capitol as a brilliant white building, that was not always the case...when the collapse occurred it was actually a buff color, trimmed in white. 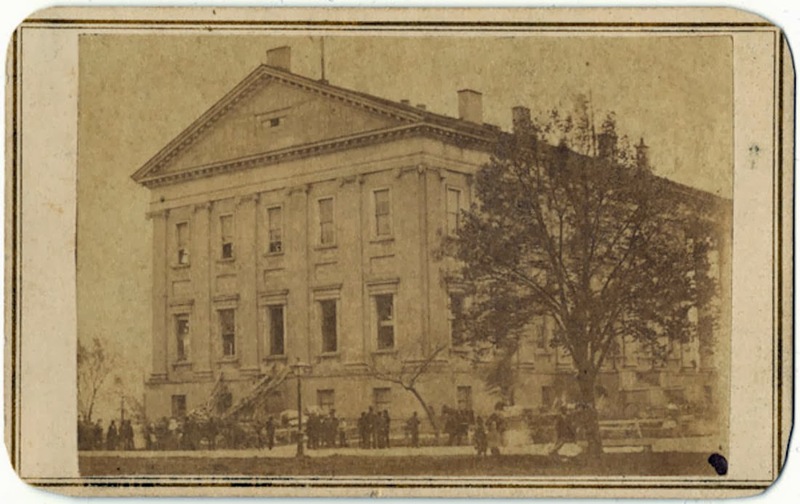 The VA State Capitol Disaster also affected Richmond's City Hall. Richmond's original City Hall was built in 1818, and when the Capitol Disaster occurred, it sent the city leaders scurrying to examine their own buildings, in particular the original City Hall. 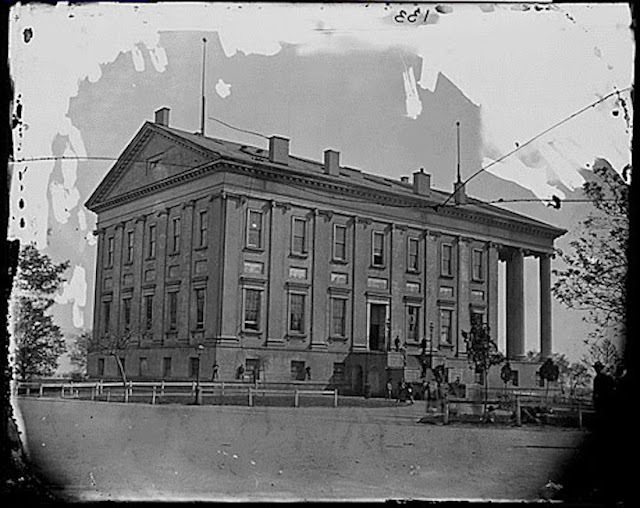 And, in the finest tradition of governments in panic everywhere, they freaked and overreacted, declaring the original City Hall in danger of imminent collapse and ordering it's immediate demolition...well, not that immediate, because they didn't start tearing it down until 1874. Of course when they started tearing it down, they found that it was actually structurally sound. And of course, by the time they realized this, they were far enough along in the demolition process that they had to continue. And when they finished demolishing the building, Richmond's city government was in the exact same spot that the State government had been in after the Capitol floor collapse...they had no home. So they found temporary quarters, and five years later set aside three hundred grand to build a new City Hall on the same site as the old one, hired Elijah E Meyers, a well respected architect who had designed several State Capitols and other government buildings over the years to design it, and took to building. The Capitol was upgraded once again between 2004 and 2007 to the tune of 90 million dollars. Not only was the interior of the building renovated, a 27,000 square foot addition was built beneath the front lawn of the Capitol to accommodate visitors to the building as well as add new legislative office space, while all mechanical systems of the building were also upgraded. There's actually a fair amount of information about the disaster out there, but you have to dig for it a bit. There are very few sites a dealing with The Capitol Disaster exclusively, most of the info is buried with-in other sites. There are a couple of exceptions to that rule, though, and I tried to grab the bet few to post. (They're also the sites I used for research into this post). These are the best three, IMHO. http://www.vacapitol.org/disaster.htm A link to a contemporary article about the disaster from Harpers Weekly. This is from the Va State Capitol website. Links on the bottom of the page are for a comprehensive history of the capitol. 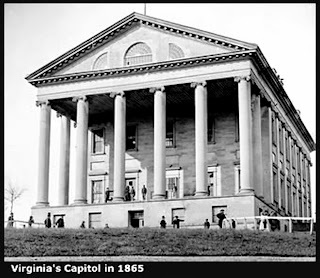 http://www.lva.virginia.gov/exhibits/capitol/beyond/ An article about the various modifications made to the capitol over the years...more links to the history of the building at the top of the page. http://babel.hathitrust.org/cgi/pt?id=loc.ark:/13960/t8nc67j9c;view=1up;seq=1 Link to the full text of a book by George L. Christian, published in 1915, about the disaster and the post Civil War politics that Virginia had to deal with. A PDF download of the book's also available on the site. A really interesting read! Love the post. Very informative. I have yet to revisit the Capital Building in it's latest remodeled state, but you've inspired me to go take a look. I am one of the few Virginians that already knew about the collapse. My triple great grandfather was one of the 62 dead. Thank you for your very informative post. I looked this up after reading Ginny Dyes Bregdan Chronicles "Misty Shadows of Hope" 1870 post Civil War story about the Capitol Collapse and was interested in more information. I am printing off your post to include with her book. http://bet-you-didnt-know.blogspot.com/ Historical trivia about just about anything that comes to mind. http://tanksseventiesmusicblog.blogspot.com/ Songs from the 60s and 70s.... Also known as The Best Music Ever Written and Recorded. Oh, yeah...a few songs from the 80s that were deemed worthy as well.